My current favorite is from Essie's 2014 neons collection. It's called I'm Addicted, which seems rather fitting. I also love shades of grey, and Essie's Cocktail Bling is awesome. Although it tops my list for polish brands, Essie is on the high end of the price scale at around $8.50 a bottle, which can add up over time. If you're on a budget, I've also had a lot of luck with a brand called Sinful Colors (I'm loving Snow Me White right now). They make hundreds of colors and you can find them many places for $1.99. And don't forget the top coat. Like some bling? My favorite glitter polish is made by Nails Inc., called Electric Lane. It is a holographic top coat that just looks like silver glitter in regular light, but the second the sun or bright light hits it, it looks like someone turned on the Christmas lights. The best regular top coat ever is called Top Seal by Nail Bliss and can be found at Sally Beauty Supply. It will make your polish shine and keeps it chip free for at least a week. 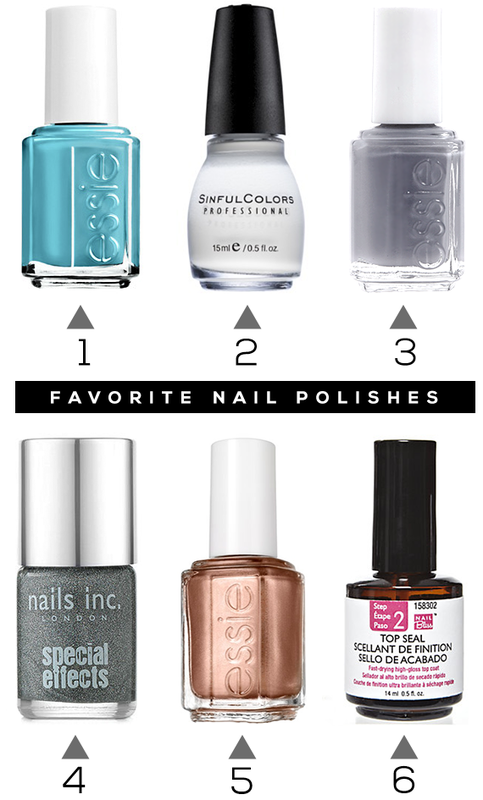 Thank you to Morgan for this great roundup of her current favorite nail polish picks! In addition to sharing her regular favorites, tips, and tutorials as Bubby & Bean's Beauty Contributor, Morgan is a high school Psychology and Sociology teacher, who, in her free time, can be found gardening, cooking (you can see some of her recipes here), drinking wine, or moonlighting as an amateur makeup artist. That holographic topcoat looks so cool! I use mostly Essie too but I also like OPI. I love those colors! But, because I often wear those colors a lot of I have been moving away from them for my nails. I just had a manicure the other day I opted for a mustard yellow. I absolutely love it. Just painted my nails :-) To me it's some sort of meditation, does that sound weird? I definitely qualify as a nailpolish fiend - my collection of colours is at around 50 right now, but it never stops growing! Like you, Essie is my brand of choice. I haven't checked out their summer collection yet but rarely a month goes by that I don't wear Chinchilly for at least a week. I'm also loving Chanel's May right now - it's the prettiest pink! I love #1! So into that pretty color lately. I m a big fan of Essie Nailpolishes! Penny Talk is Sooo pretty! I need to get some of that sparkly top coat too. essie is my favorite brand too! people think im crazy when they see my collection but i love how easy it is to just change it up all the time -- and cocktail bling is now on my list of to-buys! That top combo is seriously amazing. So fresh! I lovelovelove nail polish. I am *obsessed* with nail polish. I need "I'm Addicted". What a perfect Summer color!